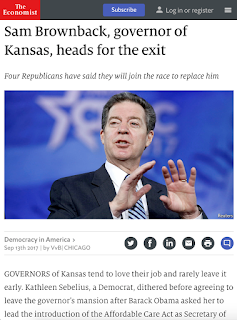 The recently overturned Kansas tax experiment was sold to Kansans with a tall tale: “Big income tax cuts bring economic prosperity without any pain.” Eventually most Kansans realized the story was false, and their legislators ended the experiment this year with a bipartisan veto override. Legislators on the losing side of the override vote made speeches claiming Kansas had a spending problem, not a revenue problem. Sam Brownback denounced “excessive spending” even as he signed the newly passed state budget. Tax cut apologists at places like the American Legislative Exchange Council began arguing that tax cuts work, it’s just that in Kansas spending was not reduced enough to match revenue losses. And just days after the override vote, Kris Kobach entered the governor’s race, blasting the vote as an effort to “feed” state government spending. It’s easy to discern that the too-much-spending rhetoric is the old tall tale morphed into a new form. Here’s the test: If the talk was credible, the talkers would be able to provide a coherent list of spending to be cut from the state budget. But they don’t. Brownback could have issued line-item vetoes to knock out the spending he considered excessive. But he didn’t. If Kansas spends too much, what should be cut? Name it. Education? Highways? Health services? Realistic spending cuts are produced by getting rid of inefficiencies, or finding less expensive alternatives to current practices, or convincing constituents that something does not need to be done anymore. That happens through the grind of the annual budget process, through vigorous and detailed debate. It can be hard, tedious work, far different from just declaring that spending is too high. In the just completed legislative session, lawmakers created a reasonable budget. The process was open. They grappled with the recommendations from an efficiency study and seriously worked to address the school finance court case. The result they produced was not lavish. Many needs were left unmet. Even so, revenue had fallen so low as a result of the Brownback tax cuts that Kansas was almost $1 billion short of meeting expenses. Lawmakers had no choice but to end the tax experiment. Expenses in the Kansas budget almost entirely go to education, human services, highways, and public safety. No easy cuts there. Citizens want and expect those services. Certainly lawmakers should always be on the lookout for ways to keep spending as low as possible, but future expenses are far more likely to go up than to go down as lawmakers work to get school funding back to an adequate level and undo the damage from raiding the highway fund. Kansas has a good deal of work ahead to regain financial stability—but excessive spending isn’t one of the problems requiring a solution. Those complaining of overspending in our state who cannot offer specific places that could be cut would lead the state nowhere. They tell a tall tale.